Genderqueer Drag Queen Maebe A. Girl Is Running for Office in L.A.
A drag performer is seeking a spot on the Silver Lake Neighborhood Council in Los Angeles. A drag queen known for impersonations of political figures like Melania Trump and Kellyanne Conway is making her own run for public office. Maebe A. Girl is seeking a spot on the Silver Lake Neighborhood Council in Los Angeles. Girl — who identifies as genderqueer and nonbinary and uses she/her and they/them pronouns — is running on a pro-LGBTQ platform. In a statement sent to The Advocate, she highlighted the necessity for queer people to have a seat at the table in politics during a time period when federal recognition is being erased. “Drag has always been political, and the mere act of being in drag in public is a political statement," Maebe said. "We’re here, we’re queer, and we’re not going anywhere. I hope my run inspires other queens to use their skills as public speakers and entertainers to promote the LGBT agenda — which is inclusion and recognition for all types of people who deter from sexuality and gender norms. I want to show that drag queens, trans folks, and all queer people are an important and valid component of our society. Our voices deserve to be heard." In addition to LGBTQ people, Maebe pledged to be a voice for intersectional communities. "While my heart and passion are in LGBT issues, I feel the need to work for all oppressed minorities, including women and immigrants," she said. Silver Lake itself is rich in LGBTQ history. Over 50 years ago, the Black Cat Tavern was the site of one of the country's earliest gay rights demonstrations in riots that sparked the founding of The Advocate. 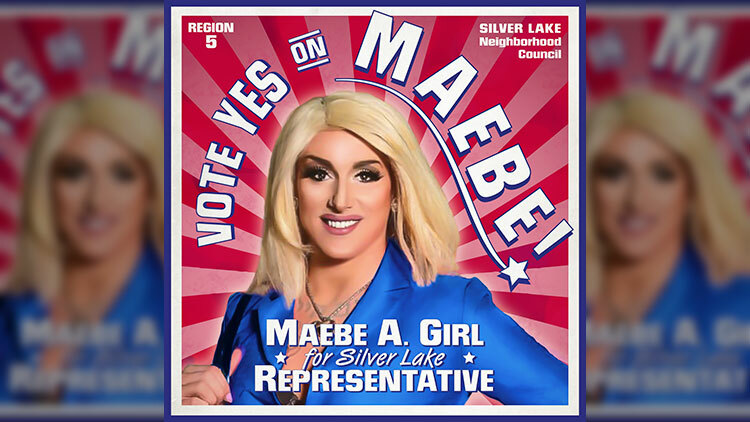 "I fully intend to preserve that queer history and ensure that Silver Lake remains a safe and welcoming place for LGBT people to live, work, and play," Maebe said. Maebe follows in the footsteps of West Coast forebear José Sarria, a drag performer who ran for the San Francisco Board of Supervisors in 1961. Sarria lost but made history as the first openly gay candidate to vie for public office in the U.S. The Silver Lake Neighborhood Council election will take place Saturday, April 16, 12 p.m. to 6 p.m. at the St. Francis of Assisi Church in Los Angeles. Learn more at SilverLakeNC.org.